The purpose of THIS thread is to keep discussion here focused PURELY on smack talk, matches, helping players find play times before the Sunday cutoff, etc. This is also where I will post weekly lineups and results. 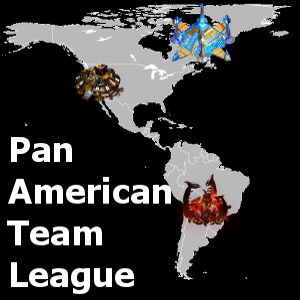 If you have GENERAL questions or GENERAL discussion about PATL please use the Pan-American Team League: Discussion thread. I'm currently donating $175. Vortex[eMg] has donated an additional $100! I've adjusted the Prizepool accordingly. If you'd like to donate or offer help in some other way, reach out to me! Another donor from the company - "Guilded" - has given another $100 towards the prize pool! PAYOUT - Payouts will be done via PayPal. If you do not have one, it's easy to sign up, all you need is a debit card or a savings account for me to transfer funds to. Teams have until the end of the countdown to play their opponents. If no time can be agreed upon, players will be forced to play on Sunday 10am PDT in channel: op PATL ON USWEST. Players have a whole week to play, the games don't all have to be done at the same time. Play at least 4 sets and if matches are tied 2-2 then we figure out the ACE match. MAKE SURE YOU SHARE RESULTS WITH ME. WINNERS SEND ME THE REPLAYS. If a player does not show, his team may "sub" a player for him. If no player or sub present themselves after 15min (9:15am PDT) then the match point is awarded to the player/team that IS present. Please take a screenshot after typing /time or show your PC clock. This will be your proof. ACE - Fighting Spirit - 1v1 - will be played if needed. ACE - Destination - 1v1 - will be played if needed. ACE - Circuit Breaker - 1v1 - will be played if needed. ACE - Neo Medusa - 1v1 - will be played if needed. ACE - Blue Storm - 1v1 - will be played if needed. ACE - Sin Peaks of Baekdu - 1v1 - will be played if needed. All matches will be attempted to be played on Battle.Net, USWest. Teams/Players can play on either server if agreed upon. Channel: op PATL on USWest is the default on Sundays. Default Turn Rate of 8, unless both players agree to a higher level. If players do not wish to have observers, then observers MUST leave. I encourage everyone to READ EVERYTHING below but I've broken things up between responsibilities of Team Leaders and Players. I also want to emphasize ONE last thing about Rosters. You are able to FREELY draft new talent to your team or remove players that have stopped playing. The one thing I have tighter restrictions on and will review on a case by case basis is Team Switching. I will not tolerate one team stacking another team and then switching back to their original team. You're on the team that you're on, STAY THERE. If you TRULY need to switch, talk to me. NO SMURFING - This does NOT give you the right to attempt to pull one over on me. I've already had ONE player try to do this and the Season hasn't even started yet and I caught him. He got a warning. If anyone attempts to do this you will be BANNED for the rest of the Season. This is my ONLY warning on the matter. I have methods to track this, do not test me. Be honest and respectful to each other and have fun. If you need to see ALL the rules - please head over to the wiki where I have relocated them. How do Teams submit lineups/How do we play? The map pool of PATL Season 1 for Weeks 1 through 12 have been announced above. If a team fails to submit 2 lineups in a row. They will automatically be removed from this Season of the PATL. Any team can be removed by Admin discretion as well due to lack of communication or failings to be diligent in encouraging your team to play/communicate. If I find you you keep setting up early times to play and your team or certain players keep FAILING to attend to those predetermined times, I may have to make drastic decisions such as benching that player for a week or something similar for wasting peoples time. I don't like my time being wasted, I'm sure most people don't. BE ADULTS GUYS. But if you FAIL to show up at a pre-determined time, the hard deadline of Sunday 10am PDT is still set in stone as the default. As I've said, if you keep jerking people around. You'll answer to me. Don't walk that path. Every game won is a point for your team. At the end of the season points will be totaled. The top FOUR highest scoring teams will be seeded into the Semi-Finals. Due to the LARGE number of teams, it is not likely your team will play against EVERY team in the League before the season ends. Teams will be seeded randomly against each other each week during the season but never replaying the same team. Good luck to everyone and may the best teams win! ALSO GUYS LET ME STRESS. PLEASE DONT SPOIL RESULTS OR SHARE REPLAYS until a week AFTER the match. Casters get the FIRST crack at the replays to cast and I want them to NOT get spoiled please. I'll post results of the games by Wednesday of each week. This gives Casters time to cast their games as long as possible without being spoiled. If you have questions or you're unsure of what to do. PLEASE CONTACT ME. Also huge props to TheNewEra for helping me out with the wiki. I got it started but he really cleaned it up nice. Teams were, are, will be randomly seeded against each other the rest of this tournament. Team Leaders. Get me your lineups ASAP so that I can start releasing Race Matchups. I will only release the Race Matchups when BOTH teams have submitted me their lineups. That way no one team gets an unfair advantage in selecting their lineup. You know I want to take this moment to thank someone that is not part of our community anymore but is the person that taught me HOW to run tournaments, even if it does not make you popular at times. I watched him run many, many tournaments over the years and if I hadn't, I don't think I would have the heart to attempt this. Duran "Xeris" Parsi. Thank you. This guy. This guy has done SO much for the American scene between 2002 and 2014 and it's really sad that there isn't a Liquipedia page on him. He has run SO many tournaments big (NASL) and small (Yankee League). He used to run weekly, monthly, yearly tournaments ALL the time and I have no idea how he did it. He was considered by MANY players the best Admin to run any tournament, he was often consulted by WCG on how to run the USA tournaments. He also took a chance on me to cast Yankee League when it first started, arguably him giving me that opportunity lead me to being noticed more and more around the community as a caster. I worked hard to promote myself but I will admit. If Xeris never took the chance on me, I do not think I would have ever gained the popularity that I did that allowed me to participate in the casting crew for THREE WCGs in a row. Xeris. I deticate this League to you. Wherever you are. hey registration my team ScD . Team Matchups released. I'm at work and I'll attempt to PM all the team leaders but give me time. If people could help make everyone aware that would be awesome. Will there be a list of players per team eventually, with main races preferably? I have the list on the other thread. I just need to transfer it here. Hard to do it on my phone but when I get home in a few hours I'll be updating the wiki. That will be the primary location to see teams, members and their races. First tournament I've ever played in for Brood War. History in the makin here, kids. I've PM'd all 20 Team Leaders. The rest is in your hands guys. The only way this League will succeed is if EVERYONE stays active and participates. I was a little late to submit lineups, can we still submit one or no? Sorry man. Your team will have to wait till Season 2. That being said, there is nothing restricting you or your players from signing up under another Team's name and playing for them. Hey I noticed a couple discrepancies that I'd like some clarification on if you don't mind. Listed above under the tab for week 1 maps you have "Blue Storm" listed as the ACE match, but under the week 1 match-ups you have Fighting Spirit listed for everyone as the ACE match.. which one is it? Also in a similar fashion, in the OP on this thread you have the game time listed as 10am PST, but in the OP of the other thread you have it listed as 10pm PST. I assume it's 10am.. but I'd hate to show up 12 hours early and think our team gets a walkover win, or conversely show up 12 hours too late and miss our games. So which one is it? Might not be a bad idea to fix it in the proper places as well in case someone misses it or reads the wrong one. Thanks man. Hard to do all this at 1am in the morning sometimes =) I'll double check everything, thanks for looking it all over. If anyone wants a 1900+ Terran player for their team, PM me. I wanted to take the time to announce, and I'll add this to the OP, that I'm in the process of securing additional funding to do an Individual Tournament. With a twist. There will be another invite before PASL that would be an OPEN tournament for anyone to join and the top 16 finishers of that event would be seeded into the PASL for a total of 32 players. This is being scheduled AFTER the New Year, during PATL's off-season. I just wanted to keep you guys in the loop. For now though let's keep the discussion of PASL in the other thread, I just wanted to post it here for visibility. Edit: I've also created a DISCORD for PATL to help Team Leaders AND Players coordinate to play their games. Discord is FREE to use on your web browser or you can download the APP on your PC or Phone. Why would you be announcing a star league that doesn't start till after the new year like that, have you gotten a case of the hypeitis ?